At last a solution to holding the side panels of wagons etc when you want to glue them. A dedicated stand for all keen modellers. 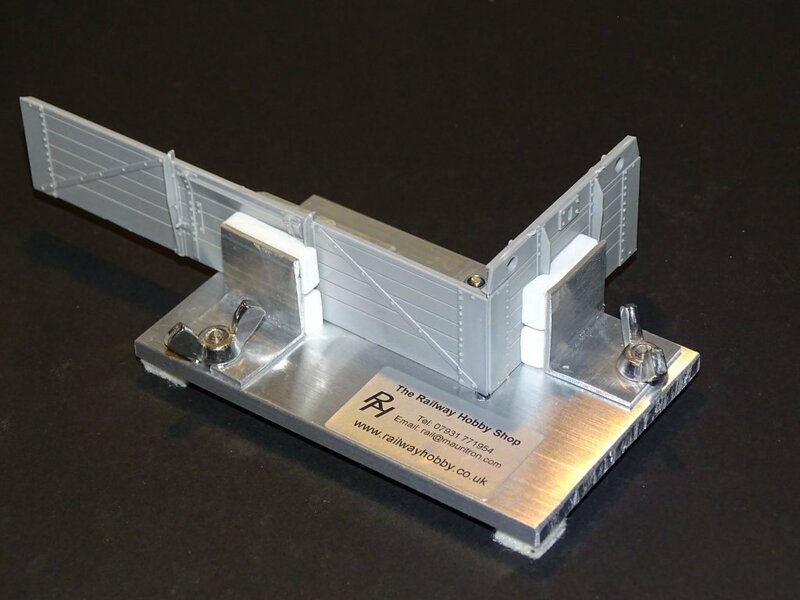 See the images of it in use when gluing some OO Gauge wagon sides using plastic weld. Useful for other models of a similar size. Comes with pads already fitted along with soft feet to protect your bench. The hole at the end of the panels is to assist in lining them up and for any solvent to drain through. (put a piece of scrap paper (or blotting paper even better) underneath to catch drips). Pad and feet colour may vary from that shown. Model panels shown are for the demonstration only and not for sale. Comes in kit form, just screw the angle's together as shown in the pictures. No need to grow a 3rd hand to hold your panels for gluing. This is one of those products which make modelling so much easier. FREE Pack of spare padding with this product.